Maine Coast Sea Vegetables Kelp Whole Leaf 2 oz. Kelp is a generic name for over 300 species of large brown algae that belong to the order Laminariales. 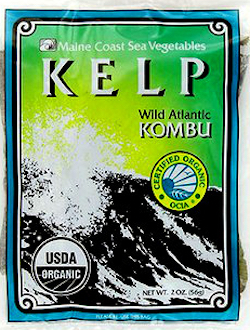 Maint Coast Sea Vegetables Kelp is Saccharina latissima (formerly known as Laminaria longicruris), also known as "Wild Atlantic Kombu," because of its similarity to Japanese Kombu. This kelp is OCIA Certified Organic and is a raw food. Maine Coast Sea Vegetables is committed to the rediscovery of this ancient food source from the sea. Their mission is twofold: to provide high-quality North Atlantic sea vegetables as user-friendly foods and to build long-term relationships with their suppliers and the environment.